Photo courtesy of the GEDCC The winners of the Greater East Dallas Chamber of Commerce’s Business Awards received their prizes at a luncheon on Aug. 21. Ben Lauer – Lauer Real Estate Group. Kathy Fielder Design | Life | Style. This award is given to recognize the outstanding East Dallas business of the year. Located in Old East Dallas, La Popular Tamale House has been serving the best tamales in Dallas since 1984. It is a family owned restaurant founded by Jesse Moreno, Sr. which offers full service authentic, unpretentious contemporary Mexican food filled with the history and soul of the neighborhood. Jesse Moreno, Jr. continues the legacy of the restaurant, and people come in from all over to enjoy the food and the company. Many years ago, they were nicknamed, “The Doctors of Tamalogy,” for their five stars tamales. They have been recognized with Best Tamales Awards from D Magazine, Dallas Observer and The Dallas Morning News. They have even been featured in the national paper USA Today. Mr. and Mrs. Moreno are lifelong residents of Old East Dallas and La Popular has been giving back to the East Dallas community since its establishment with an annual lunch on Thanksgiving Day and Christmas Day for those in need or for anyone who might not have family in Dallas. Jesse Moreno has helped to create and restore local parks to give children a safe place to play before and after school. The Morenos have been extensively involved with the Dallas Independent School District and have worked to rezone schools, to make much needed improvements, repairs and ensure that children have the supplies they need to succeed in school. The Amelia and Jesse Moreno Scholarship Award benefiting Woodrow Wilson High School Seniors was established by Jesse Moreno Jr. (WWHS ‘04) in honor of his parents. This award is given to graduating high school seniors from Woodrow Wilson High School who have shown exceptional commitment to the East Dallas community through their regular volunteerism in community organizations. This award is presented for longevity in community impact and outstanding Chamber support by a business and/or an individual associated with the business who has made an outstanding contribution to the community. The Chairman’s Award is for Youth Believing in Change as it approaches 24 years of impacting the community. Founded in 1995, Youth Believing in Change (YBC) is one of the longest-running after school programs in Dallas. Led by Dallas Theological Seminary graduate Vince Gaddis and his wife Angela, YBC began with an open Bible and a few Dr. Suess books during meeting in pizza parlors, parks, vacant apartments and churches until 2006 when philanthropist Trevor Rees-Jones provided them a challenge-match grant, which YBC tripled in 90 days in order to purchase their two-acre facility debt free. Based on report cards and STAAR test results, 92 percent of YBC children improve 10-15 percent in reading, writing and math on STAAR tests. Ninety percent maintain a GPA of 80 or better. Serving a diverse ethnic population of American born children as well as a largely refugee and immigrant population, YBC has college graduates from Baylor, NYU, SMU, UT Arlington, the University of Houston and local community colleges. This award is presented for entrepreneurial achievements and noted individual successes during the past year. Greg Nixon and Dave Kirk were two East Dallas locals with a mutual love of craft beer. White Rock Alehouse & Brewery was created to provide a community-based establishment in a fun and relaxing environment. While the locally brewed craft beer is the foundation, they take great pride in their food and the local dishes selected to complement the tailored beer menu. As part of the East Dallas community, the team at White Rock Alehouse & Brewery knows the importance of community. They support local groups and families with a comfortable space for gatherings and the chance to unwind. This month, they were a sponsor for Pulling Together, an epic tug of war event between Dallas and Fort Worth to fight children’s cancer and donated $1.00 from every WRAB house beer sold. 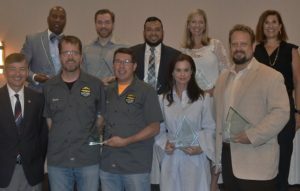 This award is given to recognize a small business/small business owner in East Dallas who is a community leader who supports and gives back to the community. Adjust Chiropractic provides conservative management of health through chiropractic care. The business was established in 2009 on Greenville Avenue in the back of a building that did not have any street presence. When that building sold, it moved to Garland Road near the Arboretum in 2011. Patients range from weekend warriors with minor aches and pains to people who have been in car accidents the same day. John is on the Chamber’s Economic Growth and Development Committee and now chairs the Garland Road Vision subcommittee. He has worked and advocated for the Gaston/Garland/Grand project. He has networked with other business neighbors on Garland Road to organize a crime watch/prevention association for the businesses that have been affected recently. Nancy Wilson has been a part of the Coldwell Banker family for more than 20 years. She has given back to community institutions in numerous ways, including Lakewood Early Childhood PTA from 1995-2006; Woodrow Wilson High School Cheer parent; SBDM in charge of safety/security, PTA; Founder of the Woodrow Wilson High School Peace Pantry serving all Woodrow students healthy snacks during the day, providing meals on weekends and holidays as well as providing gently used uniforms for those in need (a model implemented in other DallasISD schools); an original member of the White Rock Lake Conservancy, and Lake Safety Chair; City of Dallas Police Review Board; Safer Dallas; and Volunteer of the year for City Council District 9. Ben has been a realtor since 2006 and began his independent brokerage in 2012. He is a founding member of 100 Men of East Dallas, which has donated more than $8,000 to charities local to our area. That amount will grow as the organization grows. The group is made up of 100 like-minded gentlemen who want to make Dallas a better place. It meets once a quarter for one hour to hear presentations from three local charities. One of the three charities will be voted to receive $100 from each member. The winning charity will be directly given the total collected donations. Their next fundraiser is Sept. 12. Anyone with business/community ties to East Dallas who is notable for some technological, creative or business innovation is eligible. Kathy Fielder wears many hats: lifestyle and design expert, blogger, TV host, entrepreneur, manufacturer, philanthropist, equestrian, wife, mother and proud Texan. At the age of 22, Kathy started her first design firm, Studio Interiors, which was the launch pad for her successful career. Kathy’s vision, innovation, creative ideas, persistence and meticulous work ethic helped propel her as a leader in the competitive design field, earning her numerous and multi-faceted awards. Fashion Group International nominated Kathy as a Rising Star in 2017 in the category of Interior Design. Kathy will also be receiving the award for Entrepreneur of the Year by the nationally recognized Women That Soar organization. Kathy now serves at the 2018 Public Relations Chair on the prestigious Fashion Group International board.